The Nike Kobe 11 Muse Pack was just debuted by Nike Basketball following the Kobe Bryant’s magically night as he says farewell to the game he loves with a 60 point performance, along with one more victory. Borrowing individual inspiration from design pioneers including Nike’s President & CEO Mark Parker, Eric Avar and Tinker Hatfield, the Nike Kobe 11 Muse Pack champions the creativity that fuels these designers and honors Bryant as a collaborator and an innovator. 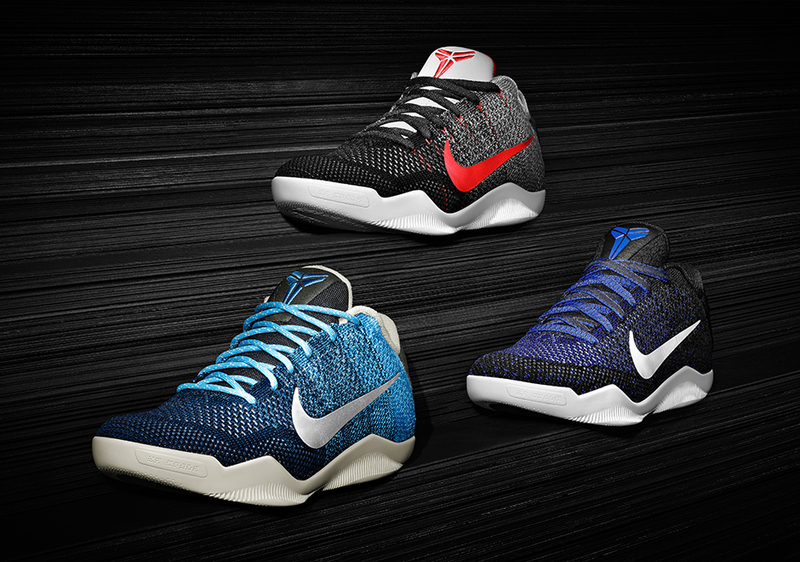 First up in the new three-shoe pack is the Nike Kobe 11 Avar Muse. This Nike Kobe 11 design reflects Bryant and Avar’s mutual interest in nature, with a particular focus on Yosemite National Park’s “El Capitan” rock formation, an elite climbing destination. “Nature in its complex simplicity is in a constant state of refinement,” explains Avar. The shoe features crafted details, like a leather patch on the right heel printed with a philosophy that Avar and Bryant share: “I see beauty in the struggle.” Similar to climbers scaling El Capitan and gazing at Yosemite’s beauty from 8,000 feet above the ground, both Bryant and Avar have overcome significant life challenges, tested themselves and remained resilient. The shoe’s Blue hues represent the sky and water seen from the California summit, while the taupe collar lining and outsole mimic the textured granite formation below. The vibrant sockliner graphic also nods to the multicolor pattern associated with Yosemite. The shoe is finished off with boot laces as a nod to the outdoors and hiking, which is synonymous with the national parks. Check out the detailed images below and look for the Nike Kobe 11 “Avar Muse” of the “Muse Pack” available now via Nike SNKRS. Nike has yet to announce release dates for the Tinker Hatfield and Mark Parker paris. The retail price tag is set at $200 USD.